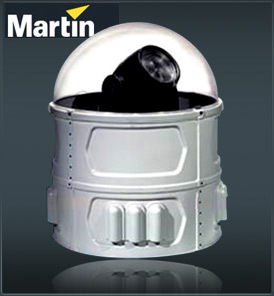 The Martin MAC Dome allows Martin luminaires to be used outdoors, yet remain in a protected environment. The Martin MAC Domee comes in two versions. One for the PAL 1200, and a smaller version taking the MAC 500 and 600. The Martin MAC Dome allows MAC luminaires, along with the PAL 1200, to be used outdoors, all year long and in any type of weather. With the Martin MAC Domee, the MAC range's wide variety of application possibilities does not end at the front door. Martin MAC Dome allow all the color, effects and movement of the MAC range to be used outside under the protection of a solid steel dome and hard acrylic shell. The Martin MAC Dome comes in two versions - the larger designed to house the PAL 1200, the smaller housing the MAC units.